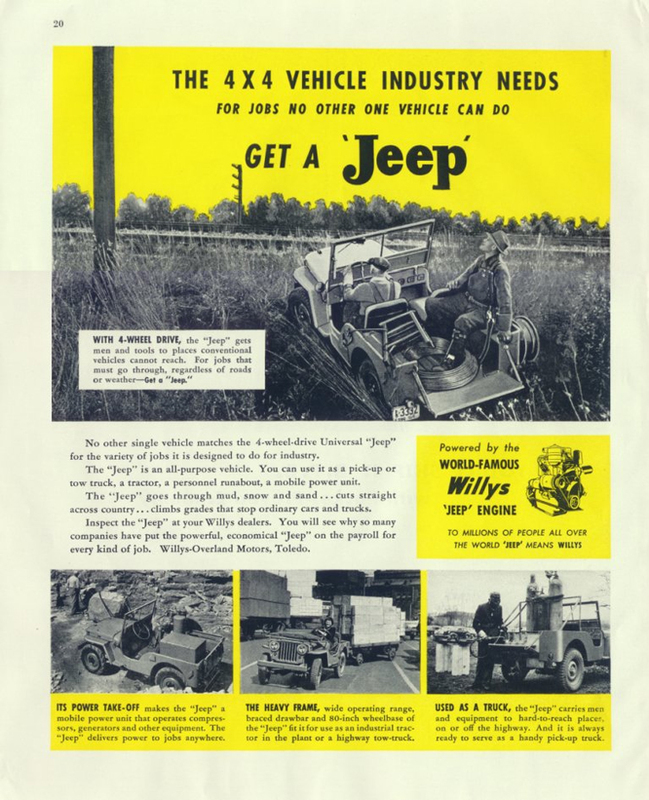 Willys was a brand name used by Willys-Overland Motors, an American automobile company best known for its design and production of military Jeeps (MBs) and civilian versions (CJs) during the 20th century. In 1908, John Willys bought the Overland Automotive Division of Standard Wheel Company and in 1912 renamed it Willys-Overland Motor Company. From 1912 to 1918, Willys was the second-largest producer of automobiles in the United States after Ford Motor Company. In 1913, Willys acquired a license to build the Charles Knight's sleeve-valve engine which it used in cars bearing the Willys-Knight nameplate. In the mid-1920s, Willys also acquired the F.B. Stearns Company of Cleveland and assumed continued production of the Stearns-Knight luxury car, as well. John Willys acquired the Electric Auto-Lite Company in 1914 and in 1917 formed the Willys Corporation to act as his holding company. In 1916, it acquired the Russell Motor Car Company of Toronto, Ontario, by 1917 New Process Gear, and in 1919 acquired the Duesenberg Motors Company plant in Elizabeth, New Jersey. The New Jersey plant was replaced by a new, larger facility and was to be the site of production for a new Willys Six, but the 1920 recession brought the Willys Corporation to its knees. The bankers hired Walter P. Chrysler to sort out the mess and the first model to go was the Willys Six, deemed an engineering disaster. Chrysler had auto engineers Owen Skelton, Carl Breer, and Fred Zeder begin work on a new car, which was often referred to as the Chrysler Six. In 1917, Ward M. Canaday, who had been doing advertising for the company, became a full-time employee. 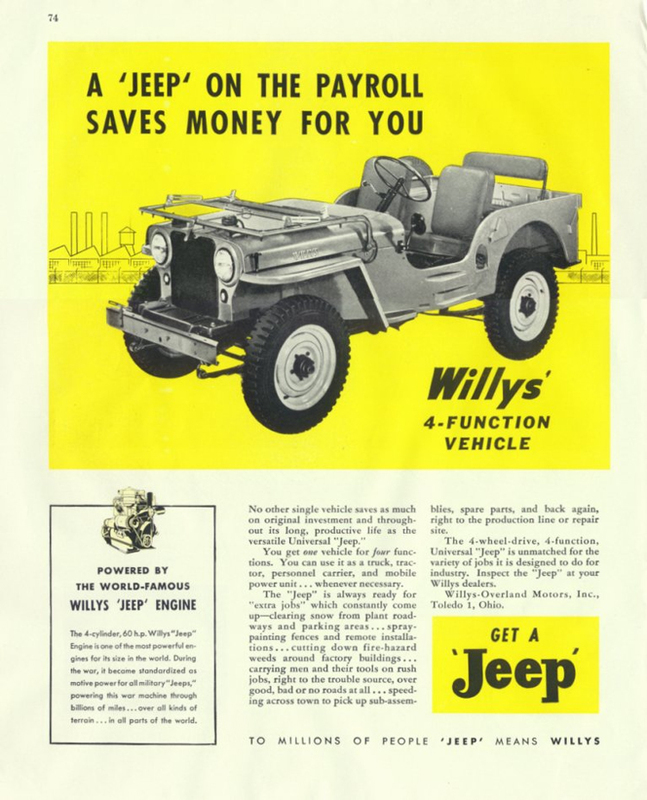 To raise cash needed to pay off debts, many of the Willys Corporation assets were put on the auction block. The Elizabeth plant and the Chrysler Six prototype were sold to William C. Durant, then in the process of building a new, third empire. The plant built Durant's low-priced Star, while the Chrysler Six prototype was improved and modified, becoming the 1923 Flint. In 1926, production of the Overland ended and the marque was replaced by the Whippet brand of small cars. In the economic depression of the 1930s, a number of Willys automotive brands faltered. Stearns-Knight was liquidated in 1929. Whippet production ended in 1931; its models were replaced by the Willys Six and Eight. Production of the Willys-Knight ended in 1933. At this time, Willys decided to clear the boards and produce two new models  the 4-cylinder Willys 77 and the 6-cylinder Willys 99  but the firm was on the verge of bankruptcy again, so only the 77 went into production. It was forced to sell its Canadian subsidiary, itself in weak financial shape, and started a massive reorganization. 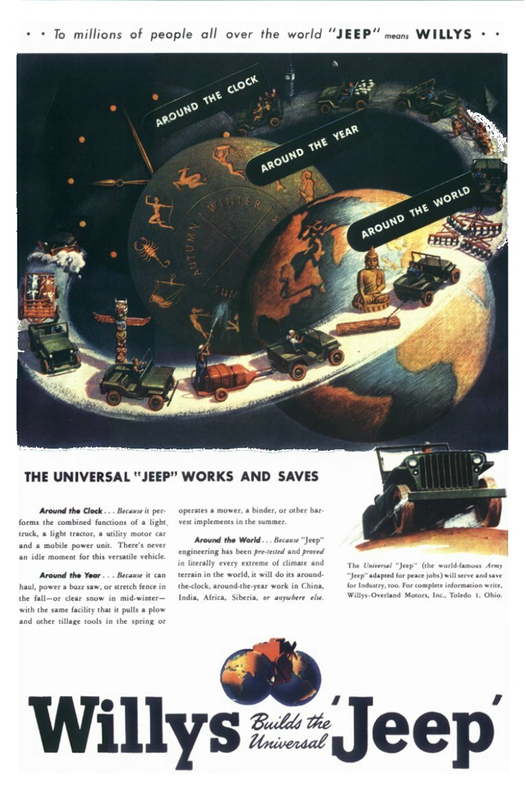 Just the main assembly plant and some smaller factories remained the property of Willys-Overland. The other assets were sold off to a new holding company that leased some of the properties back to W-O. The parent company was thus able to ride out the storm. 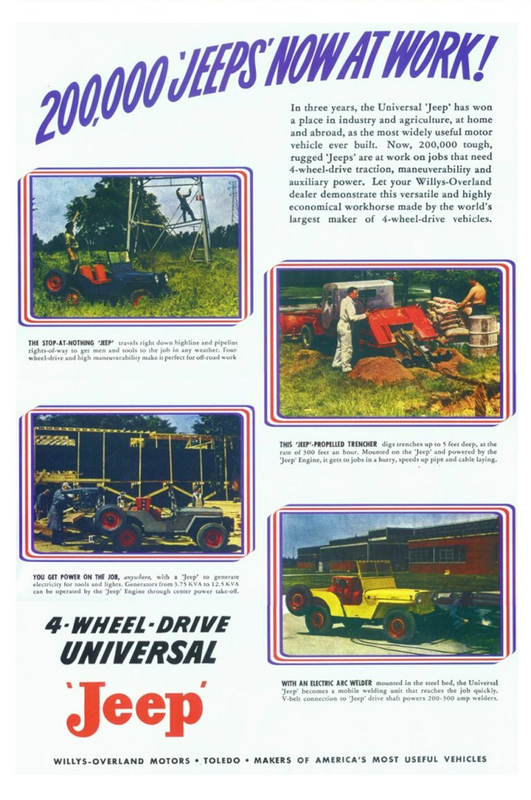 In 1936, the Willys-Overland Motor Company was reorganized as Willys-Overland Motors. In 1937, Willys redesigned 4-cylinder model. It gained a semistreamlined body with a slanted windshield, headlamps integrally embedded into the fenders, and a one-piece, rounded hood transversely hinged at the rear. For 1939, the Model 39 featured Lockheed hydraulic brakes, a two-inch increase in wheelbase to 102 inches and an improved 134 DID four-cylinder engine with power increased from 48 to 61 hp. The Model 39 was marketed as an Overland and as a Willys Overland rather than as a Willys. In 1929, the company built a factory that built vehicles located at what is now 6201 Randolph Street, Commerce City, California. During the war, the factory built aircraft assemblies for Hudson Bombers. When the war ended, the factory resumed automobile production and was one of two locations to build the first CJ2A, as well as the Willys Aero. The factory was closed in 1954. The location is now occupied by Prologis Eaves Distribution Center. Willys-Overland was one of several bidders when the War Department sought an automaker that could begin rapid production of a lightweight truck based on a design by American Bantam. "an engine that could develop 15 horsepower at 4,400 r.p.m. and run for 150 hours without failure. What he started with was an engine that developed 48 horsepower at 3,400 r.p.m., and could run continuously for only two to four hours ... It took Barney Roos two years to perfect his engine, by a whole complex of revisions that included closer tolerances, tougher alloys, aluminum pistons, and a flywheel reduced in weight from fifty-seven to thirty-one pounds". Production of the Willys MB, better known as Jeep, began in 1941, shared between Willys, Ford, and American Bantam. 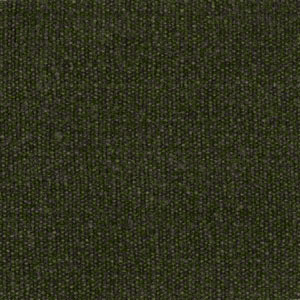 8,598 units were produced that year, and 359,851 units were produced before the end of World War II. 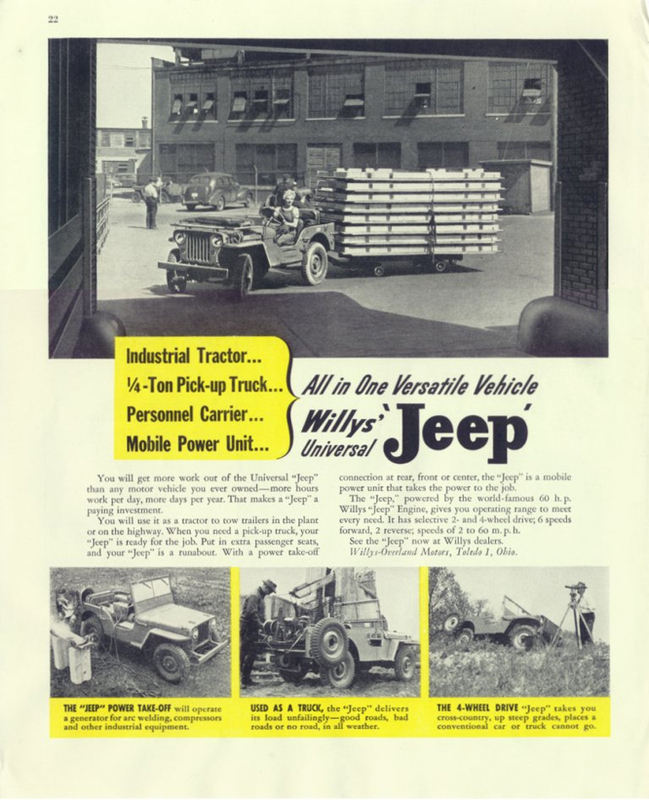 Willys-Overland ranked 48th among United States corporations in the value of World War II military production contracts. In total, 653,568 military Jeeps were manufactured. 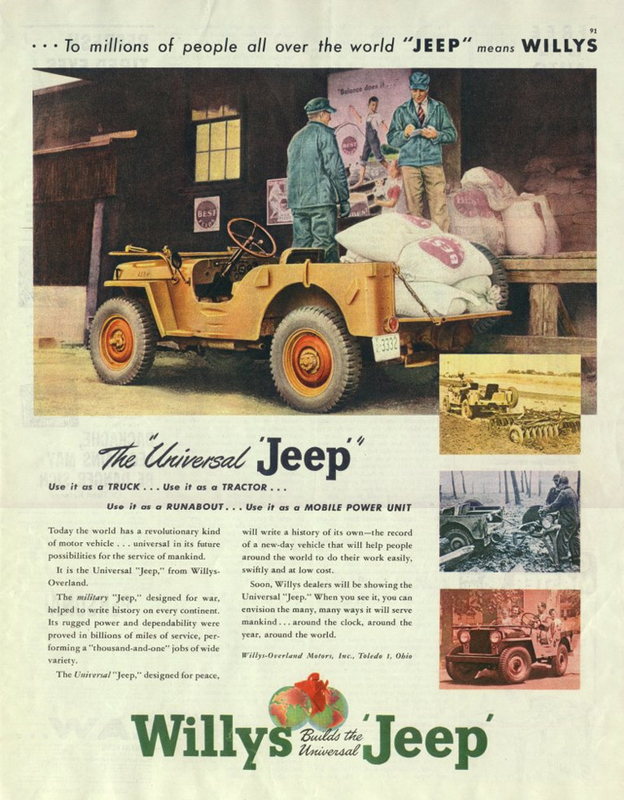 The origin of the name "Jeep" has been debated for many years. Some people believe "Jeep" is a phonetic pronunciation of the abbreviation GP, from "General Purpose", that was used as part of the official Army nomenclature. 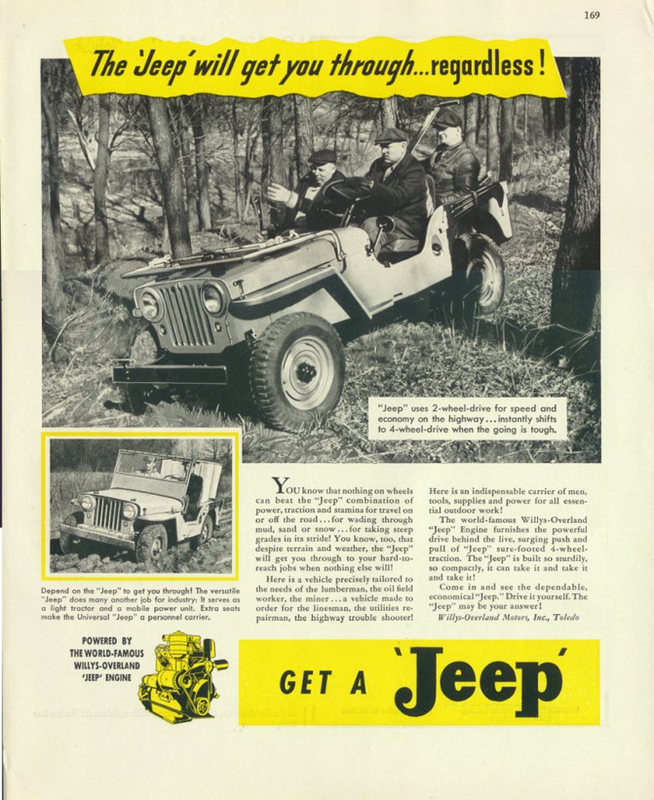 The first documented use of the word "Jeep" was the name of a character Eugene the Jeep in the Popeye comic strip, known for his supernatural abilities (e.g., walking through walls). It was also the name of a small tractor made by Minneapolis-Moline before World War II. Whatever the source, the name stuck and, after the war, Willys filed a successful trademark claim for the name. 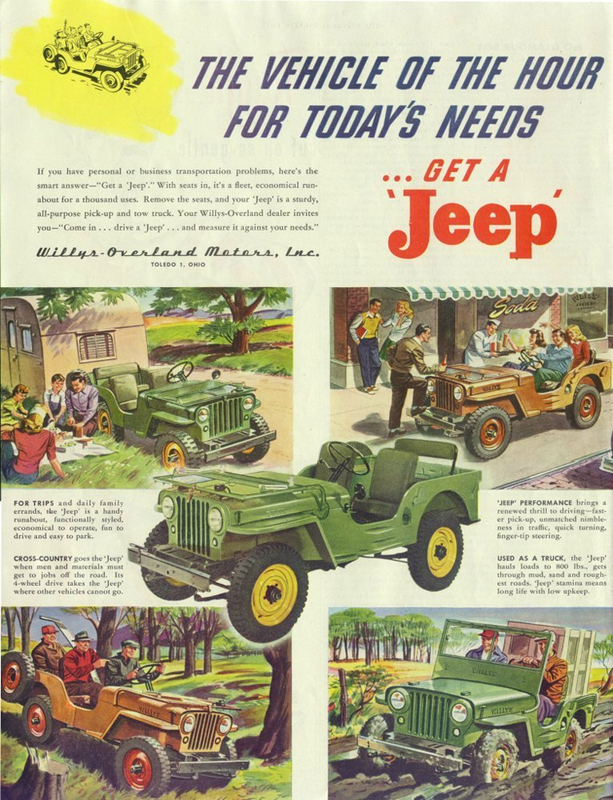 After the war, Willys did not resume production of its passenger-car models, choosing instead to concentrate on Jeeps and Jeep-based vehicles. The first postwar Willys product was the CJ-2A, an MB stripped of obviously military features, particularly the blackout lighting, and with the addition of a tailgate. Willys initially struggled to find a market for the vehicle, first attempting to sell it primarily as an alternative to the farm tractor. Tractors were in short supply, having been out of production during the war. However, sales of the "Agri-Jeep" never took off, mainly because it was too light to provide adequate draft. The CJ-2A was among the first civilian vehicles of any kind to be equipped with four-wheel drive from the factory, and it gained popularity among farmers, ranchers, hunters, and others who needed a lightweight vehicle for use on unimproved roads and trails. In 1946, a year after the introduction of the CJ-2A, Willys produced the Willys "Jeep" Utility Wagon based on the same engine and transmission, with clear styling influence from the CJ-2A Jeep. The next year came a "Jeep" Utility Truck with four-wheel drive. In 1948, the wagon was available in four-wheel drive, making it the ancestor of all sport utility vehicles. Willys planned to re-enter the passenger car market in 1947 with the Willys 6-70 sedan. Its name came from the fact it was powered by a 6-cylinder engine that produced 70 hp. The 6-70 was touted as the 'first stock car' in America that offered independent suspension on all four wheels, but it never entered production. In 1948 under a contract from the US Army, Willys produced a small one-man four-wheeled utility vehicle called the Jungle Burden Carrier which evolved into the M274 Utility ½-ton vehicle. 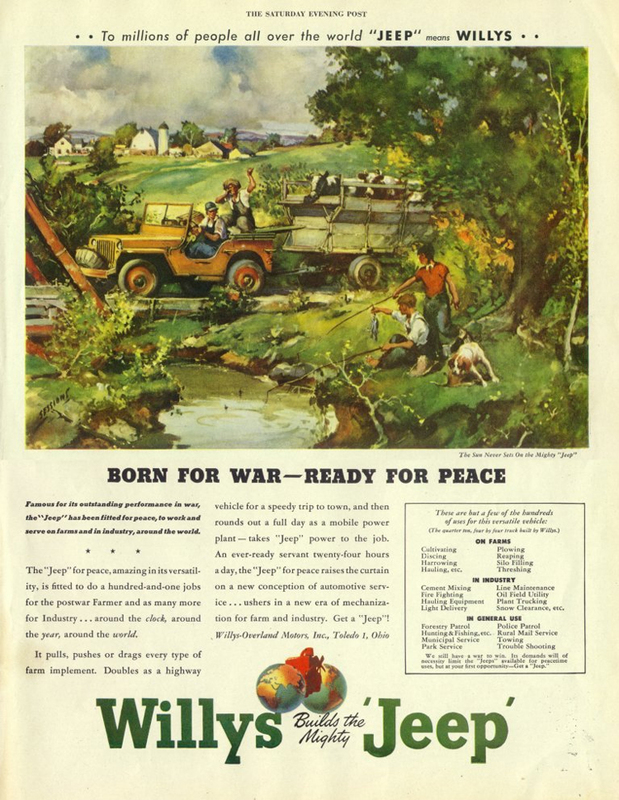 Willys later produced the M38 Jeep for the U.S. Army, and continued the CJ series of civilian Jeeps. One variation was the Jeepster, which came with a 4-cylinder or 6-cylinder engine, but only with two-wheel drive to the rear. In 1952, Willys re-entered the car market with a new compact car, the Willys Aero. At first available only as a two-door sedan, it was available with either an L-head or F-head six-cylinder engine. Export markets could get the Aero with a four-cylinder engine. A four-door sedan and a two-door hardtop were added for 1953 along with taxi models. The Aero cars were called Lark, Wing, Falcon, Ace, or Eagle depending on year, engine, and trim level, except for a small production run in its final year (1955) with models called Custom and Bermuda. The bodies for the Willys Aero were supplied by the Murray Body company, which also made the bodies for the short-lived Hudson Jet. 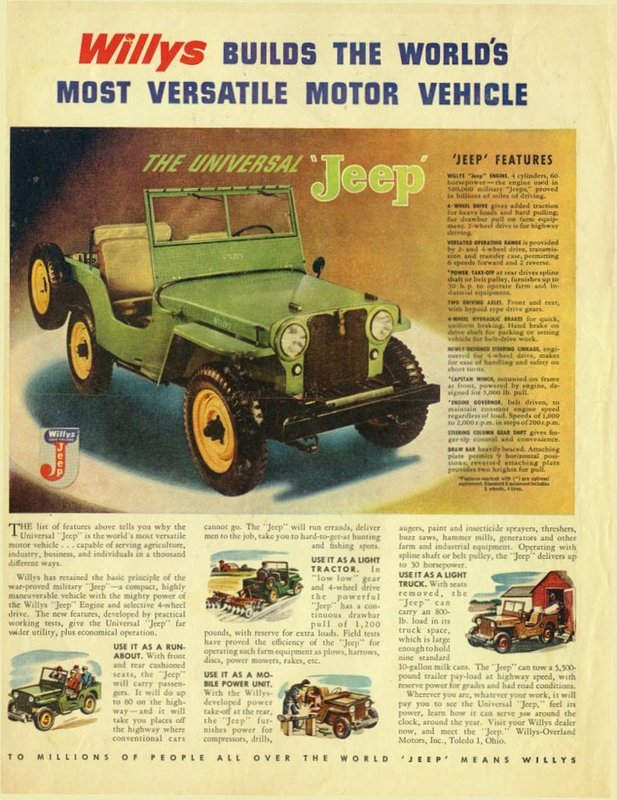 Also in 1952, CJ3B Jeeps went into production. By 1968, over 155,000 were sold. In 1953, Kaiser Motors purchased Willys-Overland and changed the company's name to Willys Motor Company. The same year, production of the Kaiser car was moved from Willow Run, Michigan, to the Willys plant at Toledo, Ohio. 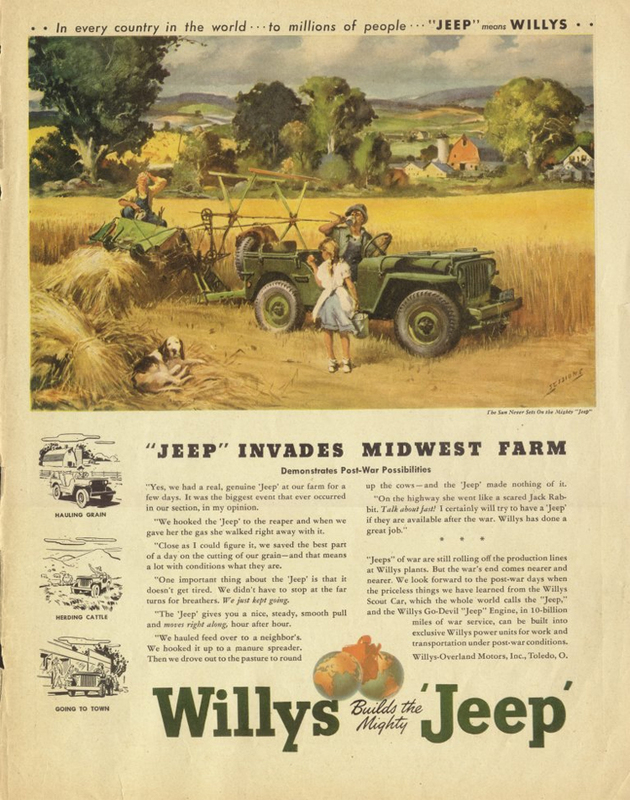 Although Jeep production was steady, sales of the Willys and Kaiser cars continued to fall. Willys established an assembly plant in Brazil in 1953, after the government prohibited the import of assembled vehicles as part of an import substitution program. In 1954, the CJ5 debuted there at the start of its three-decade run. After the last Willys passenger car was built in 1955, Willys shipped the Aero's tooling to Brazil, where it was built from 1960 to 1962, almost unchanged. Brooks Stevens restyled the Aero for 1963, and it was built by Ford (which bought the Willys factory) until the 1970s. 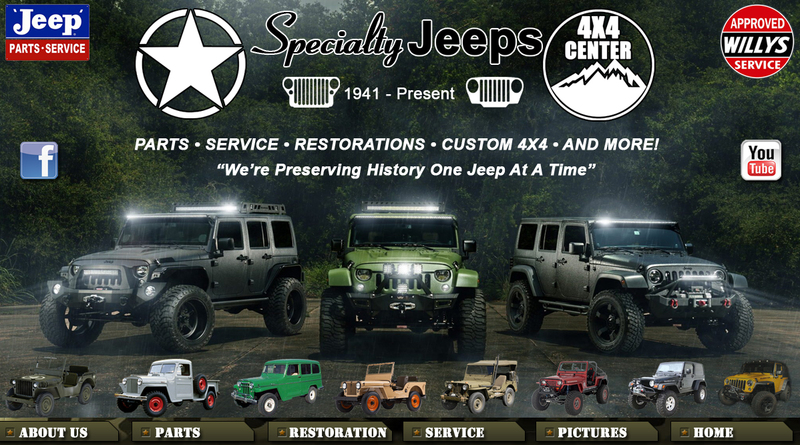 In America, the company changed its name in 1963 to Kaiser-Jeep Corporation; the Willys name disappeared thereafter. 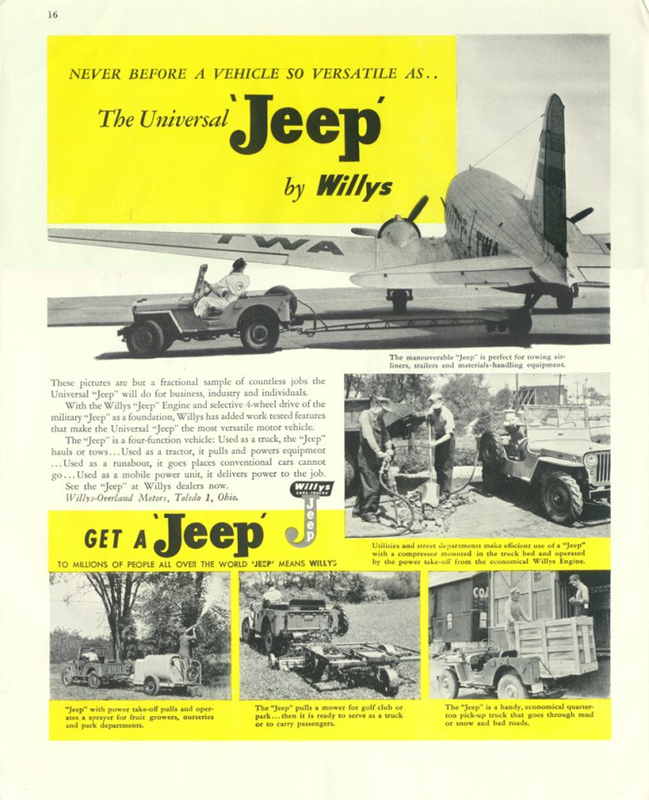 Willys-Overland established its Brazilian operations in 1953, just before the Kaiser-Frazer takeover. The tooling for the Aero went to Brazil, where it entered production in 1960. In 1956-1957, Brazil's Executive Group for the Automotive Industry (GEIA) had approved Willys-Overland for production of the Aero, the Willys MB Jeep, a truck version of the Jeep called the Rural, and the French Renault Dauphine small car. Also, an abortive plan was made to create a company called Chrysler-Willys do Brasil SA to build the 1956 Plymouth Savoy and a Dodge truck there, in the hope of taking advantage of Willys' "Brazilian-made" credentials. 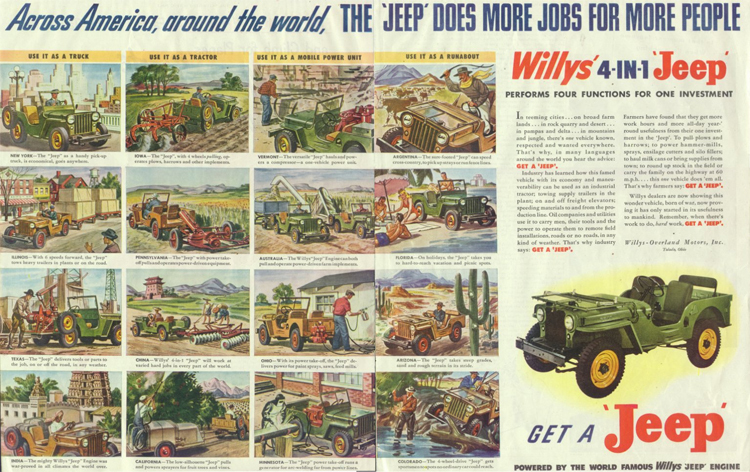 Willys went through considerable effort to appear as a Brazilian company, even selling a large portion of their company to Brazilian stockholders to forestall a possible nationalist backlash, and to become eligible for various government incentives. The little tail-engined Dauphine was a result of Kaiser's Renault connection, and was produced by Willys do Brasil from 1959 until 1968. Willys-Overland was one of the first companies to enter the Brazilian passenger automobile market, and their early entry originally paid off, with sales spiking in 1954 when Willys became the number-one selling car. Being distributed by the family of Getúlio Vargas' closest advisor Osvaldo Aranha also helped, and Willys-Overland reached a 52% share of Brazilian passenger car production in 1959. Willys held a market share of around 30% in Brazil from 1960 until 1966, its last full year as an independent, mostly Brazilian-owned company. Willys entered the Brazilian market in the hope of offsetting their shrinking market and losses at home. However, unlike in the case of the Argentinian Kaiser operations, which were essentially developed around hand-me-downs, Willys built a very modern plant from the ground up in Brazil. The original promise was to build cars for export back to the United States, but such a situation never materialized. However, by late 1961, Brazilian-built Willys Jeeps began to be exported to Chile. Willys expanded into Brazil's impoverished northeast in the early 1960s, when they built an assembly plant for the Jeep and Rural in the state of Pernambuco. In 1962, Willys started building the French Alpine A108 as the Willys Interlagos. It was produced until 1966 and was the first Brazilian-made sports car. It was also the car in which many Brazilian racers cut their teeth, including greats such as Emerson Fittipaldi. Willys also designed and showed a larger sports car called the "Capeta" (Devil) in 1964, powered by the 2.6-litre six-cylinder Aero engine. In 1965, Willys Overland do Brasil and Renault began collaborating on a new front-wheel drive car, called "Project M" and meant to replace the aging Dauphine. Developed in parallel with the Renault 12, which it antedated, the car eventually saw light as the Ford Corcel. Early Corcels had "Willys" stamping in the glass, and the Corcel line (which continued in production until 1997 as the Ford Pampa) always showed its French origins in its characteristic three-bolt wheels. In 1967, Ford took a controlling interest in Kaiser and thereby gained control of Willys-Overland do Brasil. The Aero-based Itamaraty continued in production until the early 1970s, in latter years wearing "Ford" badges. Dauphine production ended in 1968, but the Willys Rural/Pickup and its derivatives were built as the Ford F-75 until 1983. The only visual difference is that the post-1970 cars have a tailgate with "Ford" rather than "Jeep" stamped in it. The military version of the Jeep Pickup was called the F-85. Kaiser-Jeep was sold to American Motors Corporation (AMC) in 1970 when Kaiser Industries decided to leave the automobile business. After the sale, AMC used engines it had developed for its other cars in Jeep models to improve performance and standardize production and servicing. Renault purchased a major stake in AMC in 1979 and took over operation of the company, producing the CJ series until 1986. Chrysler purchased AMC in 1987 after the CJ had already been replaced with the Jeep Wrangler (also known as the YJ and later TJ), which had little in common with the CJ series other than outward appearance. The Jeep marque, owned by DaimlerChrysler and later Fiat, produces Jeep vehicles at a new Toledo Complex. DaimlerChrysler introduced the Overland name for a trim package on the 2003 Jeep Grand Cherokee. The badging is a recreation of the Overland nameplate from the early twentieth century.